In this episode Shahriar investigates a faulty Agilent 53152A 46GHz frequency counter. 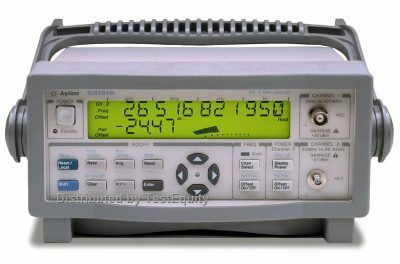 The instrument does not power on and shows no sign of internal voltage presence. Teardown of the instrument reveals a large PCB where all analog and digital circuity is contained. The power supply module is a module components and upon measurements shows no activity. The power supply is a simple switching architecture with functioning input rectifier and capacitor filter. By using an oscilloscope it is clear that the power supply PWM controller attempts to start. However, the main power supply pin shows unstable voltages indicating inadequate charge retention on the rectifying capacitor. Replacing the capacitor revives the startup condition and the power supply function returns. The PWM controller and main switching transistors are also replaced with new ones. After this repair the unit powers on and passes all self-tests. The unit can successfully measure signal frequencies and power. More details at The Signal Path. This entry was posted on Wednesday, August 9th, 2017 at 9:25 pm	and is filed under RF, Teardowns. You can follow any responses to this entry through the RSS 2.0 feed. You can skip to the end and leave a response. Pinging is currently not allowed.